1. Resolved, That California, with suitable boundaries, ought, upon her application to be admitted as one of the States of this Union, without the imposition by Congress of any restriction in respect to the exclusion or introduction of slavery within those boundaries. 2. 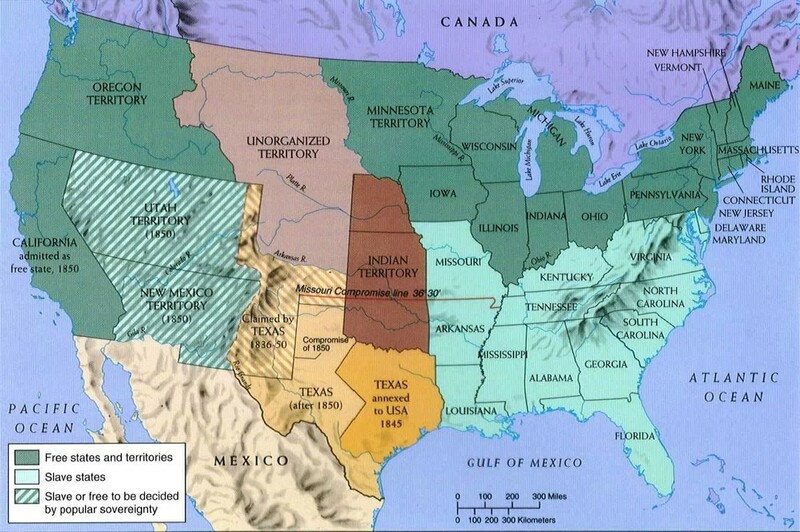 Resolved, That as slavery does not exist by law, and is not likely to be introduced into any of the territory acquired by the United States from the republic of Mexico, it is inexpedient for Congress to provide by law either for its introduction into, or exclusion from, any part of the said territory; and that appropriate territorial governments ought to be established by Congress in all of the said territory, not assigned as the boundaries of the proposed State of California, without the adoption of any restriction or condition on the subject of slavery. 3. Resolved, That the western boundary of the State of Texas ought to be fixed on the Rio del Norte, commencing one marine league from its mouth, and running up that river to the southern line of New Mexico; thence with that line eastwardly, and so continuing in the same direction to the line as established between the United States and Spain, excluding any portion of New Mexico, whether lying on the east or west of that river. 4. Resolved, That it be proposed to the State of Texas, that the United States will provide for the payment of all that portion of the legitimate and bona fide public debt of that State contracted prior to its annexation to the United States, and for which the duties on foreign imports were pledged by the said State to its creditors, not exceeding the sum of dollars, in consideration of the said duties so pledged having been no longer applicable to that object after the said annexation, but having thenceforward become payable to the United States; and upon the condition, also, that the said State of Texas shall, by some solemn and authentic act of her legislature or of a convention, relinquish to the United States any claim which it has to any part of New Mexico. 5. Resolved, That it is inexpedient to abolish slavery in the District of Columbia whilst that institution continues to exist in the State of Maryland, without the consent of that State, without the consent of the people of the District, and without just compensation to the owners of slaves within the District. 6. But, resolved, That it is expedient to prohibit, within the District, the slave trade in slaves brought into it from States or places beyond the limits of the District, either to be sold therein as merchandise, or to be transported to other markets without the District of Columbia. 8. Resolved, That Congress has no power to promote or obstruct the trade in slaves between the slaveholding States; but that the admission or exclusion of slaves brought from one into another of them, depends exclusively upon their own particular laws. An Act proposing to the State of Texas the Establishment of her Northern and Western Boundaries, the Relinquishment by the said State of all Territory claimed by her exterior to said boundaries, and of all her Claims upon the United States, and to establish a territorial Government for New Mexico. FIRST. The State of Texas will agree that her boundary on the north shall commence at the point at which the meridian of one hundred degrees west from Greenwich is intersected by the parallel of thirty-six degrees thirty minutes north latitude, and shall run from said point due west to the meridian of one hundred and three degrees west from Greenwich; thence her boundary shall run due south to the thirty-second degree of north latitude; thence on the said parallel of thirty-two degrees of north latitude to the Rio Bravo del Norte, and thence with the channel of said river to the Gulf of Mexico. SECOND. The State of Texas cedes to the United States all her claim to territory exterior to the limits and boundaries which she agrees to establish by the first article of this agreement. THIRD. The State of Texas relinquishes all claim upon the United States for liability of the debts of Texas, and for compensation or indemnity for the surrender to the United States of her ships, forts, arsenals, custom-houses, custom-house revenue, arms and munitions of war, and public buildings with their sites, which became the property of the United States at the time of the annexation. FOURTH. The United States, in consideration of said establishment of boundaries, cession of claim, to territory, and relinquishment of claims, will pay to the State of Texas the sum of ten millions of dollars in a stock bearing five per cent interest, and redeemable at the end of fourteen years, the interest payable half-yearly at the treasury of the United States. FIFTH. Immediately after the President of the United States shall have been furnished with an authentic copy of the act of the general assembly of Texas accepting these propositions, he shall cause the stock to be issued in favor of the State of Texas, as provided for in the fourth article of this agreement: Provided, also, That no more than five millions of said stock shall be issued until the creditors of the State holding bonds and other certificates of stock of Texas for which duties on imports were specially pledged, shall first file at the treasury of the United States releases of all claim against the United States for or on account of said bonds or certificates in such form as shall be prescribed by the Secretary of the Treasury and approved by the president of the United States: Provided, That nothing herein contained shall be construed to impair or qualify any thing contained in the third article of the second section of the " joint resolution for annexing Texas to the United States," approved March first, eighteen hundred and forty-five; either as regards the number of States that may here- after be formed out of the State of Texas, or otherwise. SEC. 2. And be it further enacted, That all that portion of the Territory of the United States bounded as follows: Beginning at a point in the Colorado River where the boundary line with the republic of Mexico crosses the same; thence eastwardly with the said boundary line to the Rio Grande; thence following the main channel of said river the parallel of the thirty-second degree of north latitude ; thence east with said degree to its intersection with the one hundred and third degree of longitude west of Greenwich; thence north with said degree of longitude to the parallel of thirty-eighth degree of north latitude; thence west with said parallel to the summit of the Sierra Madre; thence south with the crest of said mountains to the thirty-seventh parallel of north latitude; thence west with said parallel to its intersection with the boundary line of the State of California; thence with said boundary line to the place of beginning- be, and the same is hereby, erected into a temporary government, by the name of the Territory of New Mexico: Provided, That nothing in this act contained shall be construed to inhibit the government of the United States from dividing said Territory into two or more Territories, in such manner and at such times as Congress shall deem convenient and proper, or from attaching any portion thereof to any other Territory or State: And provided, further, That, when admitted as a State, the said Territory, or any portion of the same, shall be received into the Union, with or without slavery, as their constitution may prescribe at the time of their admission. SEC. 3. And be it further enacted, That the executive power and authority in and over said Territory of New Mexico shall be vested in, a governor, who shall hold his office for four years, and until his successor shall be appointed and qualified, unless sooner removed by the President of the United States. The governor shall reside within said Territory, shall be commander-in-chief of the militia thereof, shall perform the duties and receive the emoluments of superintendent of Indian affairs, and shall approve all laws passed by the legislative assembly before they shall take effect; he may grant pardons for offences against the laws of said Territory, and reprieves for offences against the laws of the United States, until the decision of the President can be made known thereon. he shall commission all officers who shall be appointed to office under the laws of the said Territory, and shall take care that the laws be faithfully executed. SEC. 4. And be it further enacted, That there shall be a secretary of said Territory, who shall reside therein, and hold his office for four years, unless sooner removed by the President of the United States; he shall record and preserve all the laws and proceedings of the legislative assembly hereinafter constituted and all the acts and proceedings of the governor in his executive department ; he shall transmit one copy of the laws and one copy of the executive proceedings, on or before the first day of December in each year, to the President of the United States, and, at the same time, two copies of the laws to the Speaker of the House of Representatives and the President of the Senate, for the use of Congress. And, in case of the death, removal, resignation, or other necessary absence of the governor from the Territory, the secretary shall have, and he is hereby authorized and required to execute and perform all the powers and duties of the governor during such vacancy or necessary absence, or until another governor shall be duly appointed to fill such vacancy. SEC. 5. And be it further enacted, That the legislative power and authority of said Territory shall be vested in the governor and a legislative assembly. The legislative assembly shall consist of a Council and House of Representatives. The Council shall consist of thirteen members, having the qualifications of voters as hereinafter prescribed, whose term of service shall continue two years. The House of Representatives shall consist of twenty-six members, possessing the same qualifications as prescribed for members of the Council, and whose term of service shall continue one year. An apportionment shall be made, as nearly equal as practicable, among the several counties or districts, for the election of the Council and House of Representatives, giving to each section of the Territory representation in the ratio of its population, (Indians excepted) as nearly as may be. And the members of the Council and of the House of Representatives shall reside in, and be inhabitants of, the district for which they may be elected respectively. Previous to the first election, the governor shall cause a census or enumeration of the inhabitants of the several counties and districts of the Territory to be taken, and the first election shall be held at such time and places, and be conducted in such manner, as the governor shall appoint and direct; and he shall, at the same time, declare the number of the members of the Council and House of Representatives to which each of the counties or districts shall be entitled under this act. The number of persons authorized to be elected having the highest number of votes in each of said Council districts, for members of the Council, shall be declared by the governor to be duly elected to the Council; and the person or persons authorized to be elected having the greatest number of votes for the House of Representatives, equal to the number to which each county or district shall be entitled, shall be declared by the governor to be duly elected members of the House of Representatives: Provided, That in case of a tie- between two or more persons voted for, the governor shall order a new election to supply the vacancy made by such tie. And the persons thus elected to the legislative assembly shall meet at such place and on such day as the governor shall appoint; but thereafter, the time, place, and manner of holding and conducting all elections by the people, and the apportioning the representation in the several counties or districts to the Council and House of Representatives according to the population, shall be prescribed by law, as well as the day of the commencement of the regular sessions of the legislative assembly: Provided, That no one session shall exceed the term of forty days. SEC. 6. And be it further enacted, That every free white male inhabitant, above the age of twenty-one years, who shall have been a resident of said Territory at the time of the passage of this act, shall be entitled to vote at the first election, and shall be eligible to any office within the said Territory; but the qualifications of voters and of holding office, at all subsequent elections, shall be such as shall be prescribed by the legislative assembly: Provided, That the right of suffrage, and of holding office, shall be exercised only by citizens of the United States, including those recognized as citizens by the treaty with the republic of Mexico, concluded February second, eighteen hundred and forty-eight. SEC. 7. And be it further enacted, That the legislative power of the Territory shall extend to all rightful subjects of legislation, consistent with the Constitution of the United States and the provisions of this act; but no law shall be passed interfering with the primary disposal of the soil; no tax shall be imposed upon the property of the United States; nor shall the lands or other property of non-residents be taxed higher than the lands or other property of residents. All the laws passed by the legislative assembly and governor shall be submitted to the Congress of the United States, and, if disapproved, shall be null and of no effect. SEC. 8. And be it further enacted, That all township, district, and county officers. not herein otherwise provided for, shall be appointed or elected, as the case may be, in such manner as shall be provided by the governor and legislative assembly of the Territory of New Mexico. The governor shall nominate, and, by and with the advice and consent of the legislative Council, appoint, an officers not herein otherwise provided for; and in the first instance the governor alone may appoint all said officers, who shall hold their offices until the end of the first session of the legislative assembly, and shall lay off the necessary districts for members of the Council and House of Representatives, and all other officers. SEC. 9. And be it further enacted, That no member of the legislative assembly shall hold, or be appointed to, any office which shall have been created, or the salary or emoluments of which shall have been increased while he was a member, during the term for which he was elected, and for one year after the expiration of such term; and no person holding a commission or appointment under the United States, except postmasters, shall be a member of the legislative assembly, or shall hold any office under the government of said Territory. SEC. 10. And be it further enacted, That the judicial power of said Territory shall be vested in a Supreme Court, District Courts, Probate Courts, and in justices of the peace. The Supreme Court shall consist of a chief justice and two associate justices, any two of whom shall constitute a quorum, and who shall hold a term at the seat of government of said Territory annually, and they shall hold their offices during the period of four years. The said Territory shall be divided into three judicial districts, and a District Court shall be held in each of said districts by one of the justices of the Supreme Court, at such time and place as may be prescribed by law; and the said judges shall, after their appointments, respectively, reside in the districts which shall be assigned them. The jurisdiction of the several courts herein provided for, both appellate and original, and that of the Probate Courts and of justices of the peace, shall be as limited by law: Provided, That justices of the peace shall not have jurisdiction of any matter in controversy when the title or boundaries of land may be in dispute, or where the debt or sum claimed shall exceed one hundred dollars; and the said Supreme and District Courts, respectively, shall possess chancery as well as common law jurisdiction. Each District Court, or the judge thereof, shall appoint its clerk, who shall also be the register in chancery, and shall keep his office at the place where the court may be held. Writs of error, bills of exception, and appeals, shall be allowed in all cases from the final decisions of said District Courts to the Supreme Court, under such regulations as may be pre- scribed by law, but in no case removed to the Supreme Court shall trial by jury be allowed in said court. The Supreme Court, or the justices thereof, shall appoint its own clerk, and every clerk shall hold his office at the pleasure of the court for which he shall have been appointed. Writs of error and appeals from the final decisions of said Supreme Court shall be allowed, and may be taken to the Supreme Court of the United States, in the same manner and under the same regulations as from the Circuit Courts of the United States, where the value of the property or the amount in controversy, to be ascertained by the oath or affirmation of either party, or other competent witness, shall exceed one thousand dollars; except only that in all cases involving title to slaves, the said writs of error or appeals shall be allowed and decided by the said Supreme Court without regard to the value of the matter, property, or title in controversy; and except also that a writ of error or appeal shall also be allowed to the Supreme Court of the United States from the decision of the said Supreme Court created by this act, or of any judge thereof, or of the District Courts created by this act, or of any judge thereof, upon any writ of habeas corpus involving the question of personal freedom; and each of the said District Courts shall have and exercise the same jurisdiction in all cases arising under the Constitution and laws of the United States as is vested in the Circuit and District Courts of the United States; and the said Supreme and District Courts of the said Territory, and the respective judges thereof, shall and may grant writs of habeas corpus in all cases in which the same are grantable by the judges of the United States in the District of Columbia; and the first six days of every term of said courts, or so much thereof as shall be necessary, shall be appropriated to the trial of causes arising under the said Constitution and laws; and writs of error and appeals in all such cases shall be made to the Supreme Court of said Territory, the same as in other cases. The said clerk shall receive in all such cases the same fees which the clerks of the District Courts of Oregon Territory now receive for similar services. SEC. 11. And be it further enacted, That there shall be appointed an attorney for said Territory, who shall continue in office for four years, unless sooner removed by the President, and who shall receive the same fees and salary as the attorney of the United States for the present Territory of Oregon. There shall also be a marshal for the Territory appointed, who shall hold his office for four years, unless sooner removed by the president, and who shall execute all processes issuing from the said courts when exercising their jurisdiction as Circuit and District Courts of the United States: he shall perform the duties, be subject to the same regulation and penalties, and be entitled to the same fees as the marshal of the District Court of the United States for the present Territory of Oregon, and shall, in addition, be paid two hundred [dollars] annually as a compensation for extra services. SEC. 12. And be it further enacted, That the governor secretary, chief justice and associate justices, attorney and marshal shall be nominated, and, by and with the advice and consent of the Senate, appointed by the President of the United States. The governor and secretary, to be appointed as aforesaid, shall, before they act as such, respectively take an oath or affirmation, before the district judge, or some justice of the peace in the limits of said Territory, duly authorized to administer oaths and affirmations by the laws now in force therein, or before the chief justice or some associate justice of the Supreme Court of the United States, to support the Constitution of the United States, and faithfully to discharge the duties of their respective offices; which said oaths, when so taken, shall be certified by the person by whom the same shall have been taken, and such certificates shall be received and recorded by the said secretary among the executive proceedings; and the chief justice and associate justices, and all other civil officers in said Territory, before they act as such, shall take a like oath or affirmation, before the said governor or secretary, or some judge or justice of the peace of the Territory, who may be duly commissioned and qualified, which said oath or affirmation shall be certified and transmitted, by the person taking the same, to the secretary, to be by him recorded as aforesaid; and afterwards, the like oath or affirmation shall be taken, certified, and recorded, in such manner and form as may be prescribed by law. The governor shall receive an annual salary of fifteen hundred dollars as governor, and one thousand dollars as superintendent of Indian affairs. The chief justice and associate justices shall each receive an annual salary of eighteen hundred dollars. The secretary shall receive an annual salary of eighteen hundred dollars. The said salaries shall be paid quarter-yearly, at the treasury of the United States. The members of the legislative assembly shall be entitled to receive three dollars each per day during their attendance at the sessions thereof, and three dollars each for every twenty miles' travel in going to and returning from the said sessions, estimated according to the nearest usually travelled route. There shall be appropriated annually the sum of one thousand dollars, to be expended by the governor, to defray the contingent expenses of the Territory; there shall also be appropriated annually a sufficient sum to be expended by the secretary of the Territory, and upon an estimate to be made by the Secretary of the Treasury of the United States, to defray the expenses of the legislative assembly, the printing of the laws, and other incidental expenses; and the secretary of the Territory shall annually account to the Secretary of the Treasury of the United States for the manner in which the aforesaid sum shall have been expended. SEC. 13. And be it further enacted, That the legislative assembly of the Territory of New Mexico shall hold its first session at such time and place in said Territory as the Governor thereof shall appoint and direct; and at said first session, or as soon thereafter as they shall deem expedient, the governor and legislative assembly shall proceed to locate and establish the seat of government for said Territory at such place as they may deem eligible; which place, however, shall thereafter be subject to be changed by the said governor and legislative assembly. SEC. 14. And be it further enacted, That a delegate to the House of Representatives of the United States, to serve during each Congress of the United States, may be elected by the voters qualified to elect members of the legislative assembly, who shall be entitled to the same rights and privileges as are exercised and enjoyed by the delegates from the several other Territories of the United States to the said House of Representatives. The first election shall be held at such time and places, and be conducted in such manner, as the governor shall appoint and direct; and at all subsequent elections, the times, places, and manner of holding the elections shall be prescribed by law. The person having the greatest number of votes shall be declared by the governor to be duly elected, and a certificate thereof shall be given accordingly: Provided, That such delegate shall receive no higher sum for mileage than is allowed by law to the delegate from Oregon. SEC. 15. And be it further enacted, That when the lands in said Territory shall be surveyed under the direction of the government of the United States, preparatory to bringing the same into market, sections numbered sixteen and thirty-six in each township in said Territory shall be, and the same are hereby, reserved for the purpose of being applied to schools in said Territory, and in the States and Territories hereafter to be erected out of the same. SEC. 16. And be it further enacted, That temporarily and until otherwise provided by law, the governor of said Territory may define the judicial districts of said Territory, and assign the judges who may be appointed for said Territory to the several districts, and also appoint the times and places for holding courts in the several counties or subdivisions in each of said judicial districts, by proclamation to be issued by him; but the legislative assembly, at their first or any subsequent session, may organize, alter, or modify such judicial districts, and assign the judges, and alter the times and places of holding the courts, as to them shall seem proper and convenient. SEC. 17. And be it further enacted, That the Constitution, and all laws of the United States which are not locally inapplicable, shall have the same force and effect within the said Territory of New Mexico as elsewhere within the United States. SEC. 18. And be it further enacted, That the provisions of this act be, and they are hereby, suspended until the boundary between the United States and the State of Texas shall be adjusted; and when such adjustment shall have been effected, the President of the United States shall issue his proclamation, declaring this act to be in full force and operation, and shall proceed to appoint the officers herein provided to be appointed in and for said Territory. SEC. 19. And be it further enacted, That no citizen of the United States shall be deprived of his life, liberty, or property, in said Territory, except by the judgment of his peers and the laws of the land. An Act for the admission of the State of California into the Union. Be it enacted by the Senate and House of Representatives of the United States of America in Congress assembled, That the State of California shall be one, and is hereby declared to be one, of the United States of America, and admitted into the Union on an equal footing with the original States in all respects whatever. SEC. 2. And be it further enacted, That, until the representatives in Congress shall be apportioned according to an actual enumeration of the inhabitants of the United States, the State of California shall be entitled to two representatives in Congress. SEC. 3. And be it further enacted, That the said State of California is admitted into the Union upon the express condition that the people of said State, through their legislature or otherwise, shall never interfere with the primary disposal of the public lands within its limits, and shall pass no law and do no act whereby the title of the United States to, and right to dispose of, the same shall be impaired or questioned ; and that they shall never lay any tax or assessment of any description whatsoever upon the public domain of the United States, and in no case shall non-resident proprietors, who are citizens of the United States, be taxed higher than residents; and that all the navigable waters within the said State shall be common highways, and forever free, as well to the inhabitants of said State as to the citizens of the United States, without any tax, impost, or duty therefore: Provided, That nothing herein contained shall be construed as recognizing or rejecting the propositions tendered by the people of California as articles of compact in the ordinance adopted by the convention which formed the constitution of that State. An Act to establish a Territorial Government for Utah. Be it enacted by the Senate and House of Representatives of the United States of America in Congress assembled, That all that part of the territory of the United States included within the following limits, to wit: bounded on the west by the State of California, on the north by the Territory of Oregon, and on the east by the summit of the Rocky Mountains, and on the south by the thirty-seventh parallel of north latitude, be, and the same is hereby, created into a temporary government, by the name of the Territory of Utah; and, when admitted as a State, the said Territory, or any portion of the same, shall be received into the Union, with or without slavery, as their constitution may prescribe at the time of their admission: Provided, That nothing in this act contained shall be construed to inhibit the government of the United States from dividing said Territory into two or more Territories, in such manner and at such times as Congress shall deem convenient and proper, or from attaching any portion of said Territory to any other State or Territory of the United States. SEC. 2. And be it further enacted, That the executive power and authority in and over said Territory of Utah shall be vested in a governor, who shall hold his office for four years, and until his successor shall be appointed and qualified, unless sooner removed by the President of the United States. The governor shall reside within said Territory, shall be commander-in-chief of the militia thereof, shall perform the duties and receive the emoluments of superintendent of Indian affairs, and shall approve all laws passed by the legislative assembly before they shall take effect: he may grant pardons for offences against the laws of said Territory, and reprieves for offences against the laws of the United States, until the decision of the President can be made known thereon; he shall commission all officers who shall be appointed to office under the laws of the said Territory, and shall take care that the laws be faithfully executed. SEC. 3. And be it further enacted, That there shall be a secretary of said Territory, who shall reside therein, and hold his office for four years, unless sooner removed by the President of the United States: he shall record and preserve all the laws and proceedings of the legislative assembly hereinafter constituted, and all the acts and proceedings of the governor in his executive department; he shall transmit one copy of the laws and one copy of the executive proceedings, on or before the first day of December in each year, to the President of the United States, and, at the same time, two copies of the laws to the Speaker of the House of Representatives, and the President of the Senate, for the use of Congress. And in the case of the death, removal, resignation, or other necessary absence of the governor from the Territory, the secretary shall have, and he is hereby authorized and required to execute and perform, all the powers and duties of the governor during such vacancy or necessary absence, or until another governor shall be duly appointed to fill such vacancy. SEC. 4. And be it further enacted, That the legislative power and authority of said Territory shall be vested in the governor and a legislative assembly. The legislative assembly shall consist of a Council and House of Representatives. The Council shall consist of thirteen members, having the qualifications of voters as hereinafter prescribed, whose term of service shall continue two years. The House of Representatives shall consist of twenty-six members, possessing the same qualifications as prescribed for members of the Council, and, whose term of service shall continue one year. An apportionment shall be made, as nearly equal as practicable, among the several counties or districts, for the election of the Council and House of Representatives, giving to each section of the Territory representation in the ratio of its population, Indians excepted, as nearly as may be. And the members of the Council and of the House of Representatives shall reside in, and be inhabitants of, the district for which they may be elected respectively. Previous to the first election, the governor shall cause a census or enumeration of the inhabitants of the several counties and districts of the Territory to be taken, and the first election shall be held at such time and places, and be conducted in such manner, as the governor shall appoint and direct; and he shall, at the same time, declare the number of members of the Council and House of Representatives to which each of the counties or districts shall be entitled under this act. The number of persons authorized to be elected having the highest number of votes in each of said Council districts for members of the Council, shall be declared by the governor to be duly elected to the Council; and the person or persons authorized to be elected having the highest number of votes for the House of Representatives, equal to the number to which each county or district shall be entitled, shall be declared by the governor to be duly elected members or the House of Representatives: Provided, That in case of a tie between two or more persons voted for, the governor shall order a new election to supply the vacancy made by such a tie. And the persons thus elected to the legislative assembly shall meet at such place, and on such day, as the governor shall appoint; but thereafter, the time, place, and manner of holding and conducting all elections by the people, and the apportioning the representation in the several counties or districts to the Council and House of Representatives, according to population, shall be prescribed by law, as well as the day of the commencement of the regular sessions of the legislative assembly: Provided That no one session shall exceed the term of forty days. SEC. 5. And be it further enacted, That every free white male inhabitant above the age of twenty-one years, who shall have been a resident or said Territory at the time of the passage of this act, shall he entitled to vote at the first election, and shall be eligible to any office within the said Territory; but the qualifications of voters and of holding office, at all subsequent elections, shall be such as shall be prescribed by the legislative assembly: Provided, That the right of suffrage and of holding office shall be exercised only by citizens of the United States, including those recognized as citizens by the treaty with the republic of Mexico, concluded February second, eighteen hundred and forty-eight. SEC. 6. And be it further enacted, That the legislative power of said Territory shall extend to all rightful subjects of legislation, consistent with the Constitution of the United States and the provisions of this act; but no law shall be passed interfering with the primary disposal of the soil; no tax shall be imposed upon the property of the United States; nor shall the lands or other property of non-residents be taxed higher than the lands or other property of residents. All the laws passed by the legislative assembly and governor shall be submitted to the Congress of the United States, and, if disapproved, shall be null and of no effect. SEC. 7. And be it further enacted, That all township, district, and county officers, not herein otherwise provided for, shall be appointed or elected, as the case may be, in such manner as shall be provided by the governor and legislative assembly of the territory of Utah. The governor shall nominate, and, by and with the advice and consent of the legislative Council, appoint all officers not herein otherwise pro- vided for; and in the first instance the governor alone may appoint all said officers, who shall hold their offices until the end of the first session of the legislative assembly, and shall layoff the necessary districts for members of the Council and House of Representatives, and all other offices. SEC. 8. And be it further enacted, That no member of the legislative assembly shall hold or be appointed to any office which shall have been created, or the salary or emoluments of which shall have been increased while he was a member, during the term for which he was elected, and for one year after the expiration of such term; and no person holding a commission or appointment under the United States, except postmasters, shall be a member of the legislative assembly, or shall hold any office under the government of said Territory. SEC. 9. And be it further enacted, That the judicial power of said Territory shall be vested in a Supreme Court, District Courts, Probate Courts, and in justices of the peace. The Supreme Court shall consist of a chief justice and two associate justices, any two of whom shall constitute a quorum, and who shall hold a term at the Beat of government of said Territory annually, and they shall hold their offices during the period of four years. The said Territory shall be divided into three judicial districts, and a District Court shall be held in each of said districts by one of the justices of the Supreme Court, at such time and place as may be prescribed by law; and the said judges shall, after their appointments, respectively, reside in the districts which shall be assigned them. The jurisdiction of the several courts herein provided for, both appellate and original, and that of the Probate Courts and of justices of the peace, shall be as limited by law: Provided, That justices of the peace shall not have jurisdiction of any matter in controversy when the title or boundaries of land may be in dispute, or where the debt or sum claimed shall exceed one hundred dollars; and the said Supreme and District Courts, respectively, shall possess chancery as well as common law jurisdiction. Each District Court, or the judge thereof, shall appoint its clerk, who shall also be the register in chancery, and shall keep his office at the place where the court may be held. Writs of error, bills of exception, and appeals shall be allowed in all cases from the final decisions of said District Courts to the Supreme Court, under such regulations as may be prescribed by law; but in no case removed to the Supreme Court shall trial by jury be allowed in said court. The Supreme Court, or the justices thereof, shall appoint its own clerk, and every clerk shall hold his office at the pleasure of the court for which he shall have been appointed. Writs of error, and appeals from the final decisions of said Supreme Court, shall be allowed, and may be taken to the Supreme Court of the United States, in the same manner and under the same regulations as from the Circuit Courts of the United States, where the value of the property or the amount in controversy, to be ascertained by the oath or affirmation of either party, or other competent witness, shall exceed one thousand dollars, except only that, in all cases involving title to slaves, the said writs of error or appeals shall be allowed and decided by the said Supreme Court, without regard to the value of the matter, property, or title in controversy; and except also, that a writ of error or appeal shall also be allowed to the Supreme Court of the United States, from the decisions of the said Supreme Court created by this act or of any judge thereof or of the District Courts created by this act or of any judge thereof, upon any writ of habeas corpus involving the question of personal freedom; and each of the said District Courts shall have and exercise the same jurisdiction in all cases arising under the Constitution and laws of the United States as is vested in the Circuit and District Courts of the United States; and the said Supreme and District Courts of the said Territory, and the respective judges thereof shall and may grant writs of habeas corpus in all cases in which the same are granted by the judges of the United States in the District of Columbia; and the first six days of every term of said courts, or so much thereof as shall be necessary shall be appropriated to the trial of causes arising under the said Constitution and laws; and writs of error and appeal, in all such cases, shall be made to the Supreme Court of said Territory, the same as in other cases. The said clerk shall receive in all such cases the same fees which the clerks of the District Courts of Oregon Territory now receive for similar services. SEC. 10. And be it further enacted, That there shall be appointed an attorney for said Territory, who shall continue in office for four years, unless sooner removed by the President, and who shall receive the same fees and salary as the attorney of the United States for the present Territory of Oregon. There shall also be a marshal for the Territory appointed, who shall hold his office for four years, unless sooner removed by the President, and who shall execute all processes issuing from the said courts, when exercising their jurisdiction as Circuit and District Courts of the United States: he shall perform the duties, be subject to the same regulation and penalties, and be entitled to the same fees as the marshal of the District Court of the United States for the present Territory of Oregon; and shall, in addition, be paid two hundred dollars annually as a compensation for extra services. SEC. 11. And be it further enacted, That the governor, secretary, chief justice and associate justices, attorney and marshal, shall be nominated, and, by and with the advice and consent of the Senate, appointed by the President of the United States. The governor and secretary to be appointed as aforesaid shall, before they act as such. respectively, take an oath or affirmation, before the district judge, or some justice of the peace in the limits of said Territory, duly authorized to administer oaths and affirmations by the laws now in force there-in or before the chief justice or some associate justice of the Supreme Court of the United States, to support the Constitution of the United States, and faithfully to discharge the duties of their respective offices; which said oaths, when so taken, shall be certified by the person by whom the same shall have been taken, and such certificates shall be received and recorded by the said secretary among the executive proceedings; and the chief justice and associate justices, and all other civil officers in said Territory, before they act as such, shall take a like oath or affirmation, before the said governor or secretary, or some judge or justice of the peace of the Territory who may be duly commissioned and qualified, which said oath or affirmation shall be certified and transmitted, by the person taking the same, to the secretary, to be by him recorded as aforesaid; and afterwards, the like oath or affirmation shall be taken, certified, and recorded, in such manner and form as may he prescribed by law. The governor shall receive an annual salary of fifteen hundred dollars as governor, and one thousand dollars as superintendent of Indian affairs. The chief justice and associate justices shall each receive an annual salary of eighteen hundred dollars. The secretary shall receive an annual salary of eighteen hundred dollars. The said salaries shall be paid quarter- yearly, at the treasury of the United States. The members of the legislative assembly shall be entitled to receive three dollars each per day during their attendance at the sessions thereof, and three dollars each for twenty miles' travel, in going to and returning from the said sessions, estimated according to the nearest usually travelled route. There shall be appropriated annually the sum of one thousand dollars, to be expended by the governor, to defray the contingent expenses of the Territory. There shall also be appropriated, annually, a sufficient sum, to be expended by the secretary of the Territory, and upon an estimate to be made by the Secretary of the Treasury of the United States, to defray the expenses of the legislative assembly, the printing of the laws, and other incidental expenses; and the secretary of the Territory shall annually account to the Secretary of the Treasury of the United States for the manner in which the aforesaid sum shall have been expended. SEC. 12. And be it further enacted, That the legislative assembly of the Territory of Utah shall hold its first session at such time and place in said Territory as the governor thereof shall appoint and direct; and at said first session, or as soon thereafter as they shall deem expedient, the governor and legislative assembly shall proceed to locate and establish the seat of government for said Territory at such place as they may deem eligible; which place, however, shall thereafter be, subject to be changed by the said governor and legislative assembly. And the sum of twenty thousand dollars, out of any money in the treasury not otherwise appropriated, is hereby appropriated and granted to said Territory of Utah to be applied by the governor and legislative assembly to the erection of suitable public buildings at the seat of government. SEC. 13. And be it further enacted, That a delegate to the House of Representatives of the United States, to serve during each Congress of the United States, may be elected by the voters qualified to elect members of the legislative assembly, who shall be entitled to the same rights and privileges as are exercised and enjoyed by the delegates from the several other Territories of the United States to the said House of Representatives. The first election shall be held at such time and places, and be conducted in such manner, as the governor shall appoint and direct; and at all subsequent elections, the times, places, and manner of holding the elections shall be prescribed by law. The person having the greatest number of votes shall be declared by the governor to be duly elected, and a certificate thereof shall be given accordingly: Provided, That said delegate shall receive no higher sum for mileage than is allowed by law to the delegate from Oregon. SEC. 14. And be it further enacted, That the sum or five thousand dollars be, and the same is hereby, appropriated out of any moneys in the treasury not otherwise appropriated, to be expended by and under the direction of the said governor of the territory of Utah, in the purchase of a library, to be kept at the seat of government for the use of the governor, legislative assembly, judges of the Supreme Court, secretary, marshal, and attorney of said Territory, and such other persons, and under such regulations, as shall be prescribed by law. SEC. 15. And be it further enacted, That when the lands in the said Territory shall be surveyed under the direction of the government of the United States preparatory to bringing the same into market, sections numbered sixteen and thirty-six in each township in said Territory shall be, and the same are hereby, reserved for the purpose of being applied to schools in said Territory, and in the States and Territories hereafter to be erected out of the same. SEC. 16. And be it further enacted, That temporarily, and until otherwise provided by law, the governor of said Territory may define the judicial districts of said Territory, and assign the judges who maybe appointed for said Territory to the several districts, and also appoint the times and places for holding courts in the several counties or subdivisions in each of said judicial districts, by proclamation to be issued by him; but the legislative assembly, at their first or any subsequent session, may organize, alter, or modify such judicial districts, and assign the judges, and alter the times and places of holding the courts, as to them shall seem proper and convenient. SEC.17. And be it further enacted, That the Constitution and laws of the United States are hereby extended over and declared to be in force in said Territory of Utah, so far as the same, or any provision thereof, may be applicable. An Act to amend, and supplementary to, the Act entitled "An Act respecting Fugitives from Justice, and Persons escaping from the Service of their Masters," approved February twelfth, one thousand seven hundred and ninety-three. Be it enacted by the Senate and House of Representatives of the United States of America in congress assembled, That the persons who have been, or may hereafter be, appointed commissioners, in virtue of any act of Congress, by the Circuit Courts of the United States and who, in consequence of such appointment, are authorized to exercise the powers that any justice of the peace, or other magistrate of any of the United States, may exercise in respect to offenders for any crime or offence against the United States, by arresting, imprisoning, or bailing the same under and by virtue of the thirty-third section of the act of the twenty-fourth of September seventeen hundred and eighty-nine, entitled " An Act to establish the Judicial courts of the United States," shall be, and are hereby, authorized and required to exercise and discharge all the powers and duties conferred by this act. SEC. 2. And be it further enacted, That the Superior Court of each organized Territory of the United States shall have the same power to appoint commissioners to take acknowledgements of bail and affidavits and to take depositions of witnesses in civil causes, which is now possessed by the Circuit Court of the United States; and all commissioners who shall hereafter be appointed for such purposes by the Superior Court of any organized Territory of the United States, shall possess all the powers, and exercise all the duties, conferred by law upon the commissioners appointed by the Circuit Courts of the United States for similar purposes, and shall moreover exercise and discharge all the powers and duties conferred by this act. SEC. 3. And be it further enacted, That the Circuit Courts of the United States, and the Superior Courts of each organized Territory of the United States, shall from time to time enlarge the number of commissioners, with a view to afford reasonable facilities to reclaim fugitives from labor, and to the prompt discharge of the duties imposed by this act. SEC. 4. And be it further enacted, That the commissioners above named shall have concurrent jurisdiction with the judges of the Circuit and District Courts of the United States, in their respective circuits and districts within the several States, and the judges of the Superior Courts of the Territories, severally and collectively, in term- time and vacation; and shall grant certificates to such claimants, upon satisfactory proof being made, with authority to take and remove such fugitives from service or labor, under the restrictions herein contained, to the State or Territory from which such persons may have escaped or fled. SEC. 5. And be it further enacted, That it shall be the duty of all marshals and deputy marshals to obey and execute all warrants and precepts issued under the provisions of this act, when to them directed; and should any marshal or deputy marshal refuse to receive such warrant, or other process, when tendered, or to use all proper means diligently to execute the same, he shall, on conviction thereof, be fined in the sum of one thousand dollars, to the use of such claimant, on the motion of such claimant, by the Circuit or District Court for the district of such marshal; and after arrest of such fugitive, by such marshal or his deputy, or whilst at any time in his custody under the provisions of this act, should such fugitive escape, whether with or without the assent of such marshal or his deputy, such marshal shall be liable, on his official bond, to be prosecuted for the benefit of such claimant, for the full value of the service or labor of said fugitive in the State, Territory, or District whence he escaped: and the better to enable the said commissioners, when thus appointed, to execute their duties faithfully and efficiently, in conformity with the requirements of the Constitution of the United States and of this act, they are hereby authorized and empowered, within their counties respectively, to appoint, in writing under their hands, anyone or more suitable persons, from time to time, to execute all such warrants and other process as may be issued by them in the lawful performance of their respective duties; with authority to such commissioners, or the persons to be appointed by them, to execute process as aforesaid, to summon and call to their aid the bystanders, or posse comitatus of the proper county, when necessary to ensure a faithful observance of the clause of the Constitution referred to, in conformity with the provisions of this act; and all good citizens are hereby commanded to aid and assist in the prompt and efficient execution of this law, whenever their services may he required, as aforesaid, for that purpose; and said warrants shall run, and be executed by said officers, any where in the State within which they are issued. SEC. 6. And be it further enacted, That when a person held to service or labor in any State or Territory of the United States, has heretofore or shall hereafter escape into another State or Territory of the United States, the person or persons to whom such service or labor may be due, or his, her, or their agent or attorney, duly authorized, by power of attorney, in writing, acknowledged and certified under the seal of some legal officer or court of the State or Territory in which the same may be executed, may pursue and reclaim such fugitive person, either by procuring a warrant from some one of the courts, judges, or commissioners aforesaid, of the proper circuit, district, or county, for the apprehension of such fugitive from service or labor, or by seizing and arresting such fugitive, where the same can be done without process, and by taking, or causing such person to be taken, forthwith before such court, judge, or commissioner, whose duty it shall be to hear and determine the case of such claimant in a summary manner; and upon satisfactory proof being made, by deposition or affidavit, in writing, to be taken and certified by such court, judge, or commissioner, or by other satisfactory testimony, duly taken and certified by some court, magistrate, justice of the peace, or other legal officer authorized to administer an oath and take depositions under the laws of the State or Territory from which such person owing service or labor may have escaped, with a certificate of such magistracy or other authority, as aforesaid, with the seal of the proper court or officer thereto attached, which seal shall be sufficient to establish the competency of the proof, and with proof, also by affidavit, of the identity of the person whose service or labor is claimed to be due as aforesaid, that the person so arrested does in fact owe service or labor to the person or persons claiming him or her, in the State or Territory from which such fugitive may have escaped as aforesaid, and that said per- son escaped, to make out and deliver to such claimant, his or her agent or attorney, a certificate setting forth the substantial facts as to the service or labor due from such fugitive to the claimant, and of his or her escape from the State or Territory in which such service or labor was due, to the State or Territory in which he or she was arrested, with authority to such claimant, or his or her agent or attorney, to use such reasonable force and restraint as may be necessary, under the circumstances of the case, to take and remove such fugitive person back to the State or Territory whence he or she may have escaped as aforesaid. In no trial or hearing under this act shall the testimony of such alleged fugitive be admitted in evidence; and the certificates in this and the first [fourth] section mentioned, shall be conclusive of the right of the person or persons in whose favor granted, to remove such fugitive to the State or Territory from which he escaped, and shall prevent all molestation of such person or persons by any process issued by any court judge, magistrate, or other person whomsoever. SEC. 7. And be it further enacted, That any person who shall knowingly and willingly obstruct, hinder, or prevent such claimant, his agent or attorney, or any person or persons lawfully assisting him, her, or them, from arresting such a fugitive from service or labor, either with or without process as aforesaid, or shall rescue, or attempt to rescue such fugitive from service or labor, from the custody of such claimant, his or her agent or attorney, or other person or persons lawfully assisting as aforesaid, when so arrested, pursuant to the authority herein given and declared; or shall aid, abet, or assist such person so owing service or labor as aforesaid, directly or indirectly, to escape from such claimant, his agent or attorney, or other person or persons legally authorized as aforesaid; or shall harbor or conceal such fugitive, so as to prevent the discovery and arrest of such person, after notice or knowledge of the fact that such person was a fugitive from service or labor as aforesaid, shall, for either of said offences, be subject to a fine not exceeding one thousand dollars, and imprisonment not exceeding six months, by indictment and conviction before the District Court of the United States for the district in which such offence may have been committed, or before the proper court of criminal jurisdiction, if committed within anyone of the organized Territories of the United States; and shall moreover forfeit and pay, by way of civil damages to the party injured by such illegal conduct, the sum of one thousand dollars, for each fugitive so lost as aforesaid, to be recovered by action of debt, in any of the District or Territorial Courts aforesaid, within whose jurisdiction the said offence may have been committed. SEC. 8. And be it further enacted, That the marshals, their deputies, and the clerks of the said District and Territorial Courts, shall be paid, for their services, the like fees as may be allowed to them for similar services in other cases; and where such services are rendered exclusively in the arrest, custody, and delivery of the fugitive to the claimant, his or her agent or attorney, or where such supposed fugitive may be discharged out of custody for the want of sufficient proof as afore- said, then such fees are to be paid in the whole by such claimant, his agent or attorney; and in all cases where the proceedings are before a commissioner, he shall be entitled to a fee of ten dollars in full for his services in each case, upon the delivery of the said certificate to the claimant, his or her agent or attorney; or a fee of five dollars in cases where the proof shall not, in the opinion of such commissioner, warrant such certificate and delivery, inclusive of all services incident to such arrest and examination, to be paid, in either case, by the claimant, his or her agent or attorney The person or persons authorized to exe- cute the process to be issued by such commissioners for the arrest and detention of fugitives from service or labor as aforesaid, shall also be entitled to a fee of five dollars each for each person he or they may arrest and take before any such commissioner as aforesaid, at the instance and request of such claimant, with such other fees as may be deemed reasonable by such commissioner for such other additional services as may be necessarily performed by him or them; such as attending at the examination, keeping the fugitive in custody, and providing him with food and lodging during his detention, and until the final determination of such commissioner; and, in general, for performing such other duties as may be required by such claimant, his or her attorney or agent, or commissioner in the premises, such fees to be made up in conformity with the fees usually charged by the officers of the courts of justice within the proper district or county, as near as may be practicable, and paid by such claimants, their agents or attorneys, whether such supposed fugitives from service or labor be ordered to be delivered to such claimants by the final determination of such commissioners or not. SEC. 9. And be it further enacted, That, upon affidavit made by the claimant of such fugitive, his agent or attorney, after such certificate has been issued, that he has reason to apprehend that such fugitive will be rescued by force from his or their possession before he can be taken beyond the limits of the State in which the arrest is made, it shall be the duty of the officer making the arrest to retain such fugitive in his custody, and to remove him to the State whence he fled, and there to deliver him to said claimant, his agent, or attorney. And to this end, the officer aforesaid is hereby authorized and required to employ so many persons as he may deem necessary to overcome such force, and to retain them in his service so long as circumstances may require. The said officer and his assistants, while so employed, to receive the same compensation, and to be allowed the same expenses, as are now allowed by law for transportation of criminals, to be certified by the judge of the district within which the arrest is made, and paid out of the treasury of the United States. SEC. 10. And be it further enacted, That when any person held to service or labor in any State or Territory, or in the District of Columbia, shall escape there from, the party to whom such service or labor shall be due, his, her, or their agent or attorney, may apply to any court of record therein, or judge thereof in vacation, and make satisfactory proof to such court, or judge in vacation, of the escape afore said, and that the person escaping owed service or labor to such party. Whereupon the court shall cause a record to be made of the matters so proved, and also a general description of the person so escaping, with such convenient certainty as may be; and a transcript of such record, authenticated by the attestation of the clerk and of the seal of the said court, being produced in any other State, Territory, or district in which the person so escaping may be found, and being exhibited to any judge, commissioner, or other officer authorized by the law of the United States to cause persons escaping from service or labor to be de- livered up, shall be held and taken to be full and conclusive evidence of the fact of escape, and that the service or labor of the person escaping is due to the party in such record mentioned. And upon the production by the said party of other and further evidence if necessary, either oral or by affidavit, in addition to what is contained in the said record of the identity of the person escaping, he or she shall be delivered up to the claimant. And the said court, commissioner, judge, or other person authorized by this act to grant certificates to claimants of fugitives, shall, upon the production of the record and other evidences aforesaid, grant to such claimant a certificate of his right to take any such person identified and proved to be owing service or labor as aforesaid, which certificate shall authorize such claimant to seize or arrest and transport such person to the State or Territory from which he escaped: Provided, That nothing herein contained shall be construed as requiring the production of a transcript of such record as evidence as aforesaid. But in its absence the claim shall be heard and determined upon other satisfactory proofs, competent in law. An Act to suppress the Slave Trade in the District of Columbia. Be it enacted by the Senate and House of Representatives of the United States of America in Congress assembled, That from and after the first day of January, eighteen hundred and fifty-one, it shall not be lawful to bring into the District of Columbia any slave whatever, for the purpose of being sold, or for the purpose of being placed in depot, to be subsequently transferred to any other State or place to be sold as merchandize. And if any slave shall be brought into the said District by its owner, or by the authority or consent of its owner, contrary to the provisions of this act, such slave shall thereupon become liberated and free. SEC. 2. And be it further enacted, That it shall and may be lawful for each of the corporations of the cities of Washington and Georgetown, from time to time, and as often as may be necessary, to abate, break up, and abolish any depot or place of confinement of slaves brought into the said District as merchandize, contrary to the provisions of this act, by such appropriate means as may appear to either of the said corporations expedient and proper. And the same power is hereby vested in the Levy Court of Washington County, if any attempt shall be made, within its jurisdictional limits, to establish a depot or place of confinement for slaves brought into the said District as merchandize for sale contrary to this act. Particularly notable are McPherson's new views on such matters as Manifest Destiny, Popular Sovereignty, Sectionalism, and slavery expansion issues in the 1850s, the origins of the Republican Party, the causes of secession, internal dissent and anti-war opposition in the North and the South, and the reasons for the Union's victory. The book's title refers to the sentiments that informed both the Northern and Southern views of the conflict. The South seceded in the name of that freedom of self-determination and self-government for which their fathers had fought in 1776, while the North stood fast in defense of the Union founded by those fathers as the bulwark of American liberty. Eventually, the North had to grapple with the underlying cause of the war, slavery, and adopt a policy of emancipation as a second war aim. This "new birth of freedom," as Lincoln called it, constitutes the proudest legacy of America's bloodiest conflict. This authoritative volume makes sense of that vast and confusing "second American Revolution" we call the Civil War, a war that transformed a nation and expanded our heritage of liberty. . Perhaps more than any other book, this one belongs on the bookshelf of every Civil War buff.